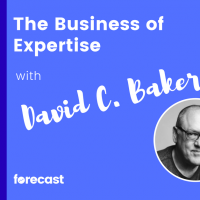 David C. Baker is the author of a fantastic book called The Business of Expertise: How Entrepreneurial Experts Turn Insights into Impact + Wealth. This book is a must-read for anyone who calls themselves an expert (i.e. you) and sells services that stem from their expertise. In this interview, David shares his professional journey and discusses how he learned many of the lessons he presents in the book (often the hard way). We also dive into some of the specific topics that David covers in the book. Plus a lightning round at the end for good measure. Is implementation a rite of passage?